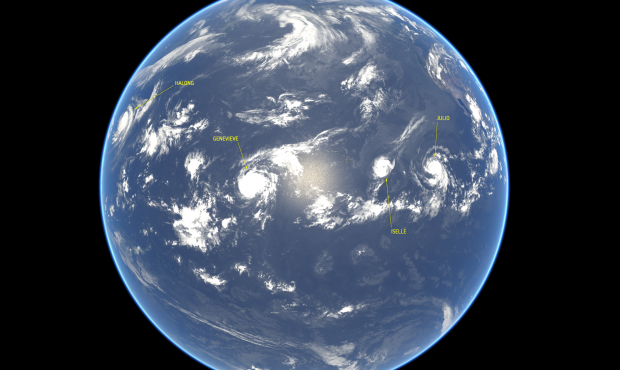 On 7 August 2014, there were four tropical cyclones active in the Pacific Ocean. 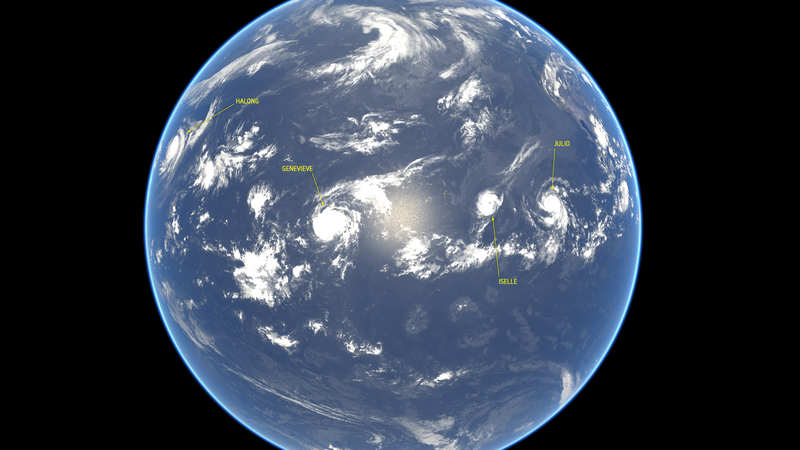 It was the first time for 12 years that four storms were active in the Pacific at the same time – and of course only in the satellite era could we show them all in a picture. The composite image above shows all four, with their designated names. Storms have names for a very simple, but very important reason : to help warn people. A storm’s name is a quick way of referring to it, and one that an affected community understands means a strong storm – the United States media in particular tend to emphasise when a depression has become strong enough to become a “named storm”. The thresholds for different storm categories are given here. The names themselves are chosen well in advance, and do not correspond to any particular people. The World Meteorological Organization (WMO) keeps the list of names, which can be changed by vote if necessary. There are different lists for the main areas where storms develop: the US National Hurricane Center, which names storms in the Atlantic and Eastern Pacific basins has alphabetical lists that start over at “A” each year – so depending on how many storms there are you might never reach letters near the end of the alphabet. Lists in other parts of the world continue from season to season, so all the names get used. In the Asia-Pacific region, typhoons are often given names of birds or animals rather than people. 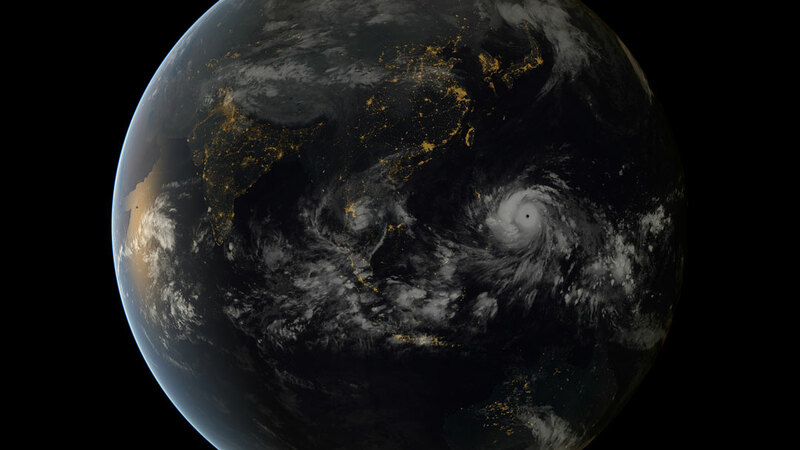 The devastating storm Haiyan, shown in the image above, was named after a word in Vietnamese meaning “sea bird”. However, storms affecting the Philippines often have an alternative name. The Philippine Atmospheric, Geophysical and Astronomical Services Administration (PAGASA) assigns names to tropical depressions before they become fully developed as tropical cyclones. The local names PAGASA uses are chosen to be more significant for the Philippine population, in the hope that the people who might be affected will react to the warnings they receive. Haiyan was called Yolanda in the Philippines. Storm Xaver was a powerful winter storm that struck Europe in December 2013, killing at least nine people and causing considerable damage through high winds, storm surges, and heavy snow. The person who selected the name, Karl-Heinz Rossfeldt, would not have known that the storm he selected would turn out to be deadly. High pressure and low pressure systems in Europe can be named by members of the public, months in advance, by “adopting” them through paying a fee to the Institute of Meteorology at the Free University of Berlin. The national meteorological services and local media broadcasting forecasts are not obliged to use these names and quite often different local names spring up. For example, a storm that felled seven million trees in Ireland in February 2014 gained the nickname ‘Darwin’ because it occurred on the 105th anniversary of Charles Darwin’s birth. Storm names that have very bad associations for the communities they struck are not used again. These names are removed from the list according to a WMO procedure and a new name is introduced. The list of retired names of Atlantic storms includes recent deadly storms such as Irene (2011) and Sandy (2012). In 2014, a piece of research into storm names got a lot of publicity because it found that in the United States, more people seemed to die in storms with female names than with male. The team who wrote the paper argued that this was because people didn’t worry so much about storms with women’s names. Critics of the research pointed out that every Atlantic hurricane had a female name until 1979, and that improvements in forecasting meant that storms have killed fewer people on average since that time. Experts in storm warnings suggested that the findings might just be a statistical fluke. The National Hurricane Center did not comment directly on the research, but pointed out that many factors need to be taken into account in encouraging people to take storm warnings seriously, including helping people to understand why and when they are at risk.